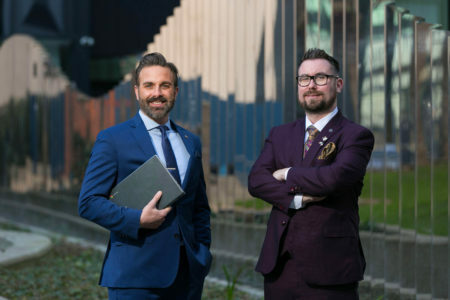 The Sea Box Group, a leading modular and offsite heating solutions provider has launched two online ecommerce companies in Ireland. They will be based from Cork and will create 20 jobs over the coming years. These are the first websites of their kind to launch in Ireland. They will operate as an online shop for tradespeople with educational resources to help with technical information. Pictured are Andrew Salerno, Global Marketing Director for Sea Box Inc and Patrick Hogan, Managing Director of Sea Box Energy. Sea Box Group owns Sea Box EMEA, NRG Awareness and Sea Box Energy Commercial. This is part of a major five year plan for expansion into e-commerce markets for the Sea Box Group with an overall investment of €1 million. The two websites will be called “Sea Box Shop” and “NRG Store”. The will partner with various companies to offer products to customers. It is expected there will be 10,000 products available on both platforms by the end of 2019. Both sites will be selling items in Ireland as well as internationally. Sea Box Shop will sell online container parts and other related container items. It is expected to have a product line of more than 300 unique items and some patented, never available before items all around the world. NRG Store will be focused on online heating, cooling and energy ecommerce. This website is for both domestic and commercial customers. Recruitment has already begun for both of these new businesses.